Hat and Mitten directions are for children 4-6 years; changes for 8-10 and 12-14 years are in parentheses. Scarf measures 5" wide x 50" long. Red Heart® Super Saver®, Art. E300 (8 ounce/452 yard skeins)-Hat: 2 (2 ¼, 2 ½) Ounces 390 Hot Red. 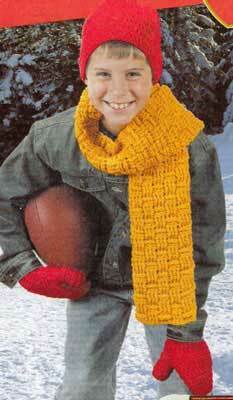 Scarf: 5 ¼ Ounces 321 Gold. Mittens: 2 (2 ½, 3) Ounces 390 Hot Red. GAUGES: Hat: 14 sts = 4"; 10 rnds = 4" in pat on smaller hook. Scarf: 17 sts = 5"; 9 rows = 4" in pat on larger hook. Mittens: 12 sts = 4"; 14 rows = 4" in sc on larger hook. CHECK YOUR GAUGE. Use any size hook to obtain the gauges. Hat Circumference: 16 (18 ¼, 19 ½)". NOTE: Use lengths of contrast yarn as markers. Ch 56 (64, 68) sts; join with a sl st to first ch, being sure ch is not twisted. Rnd 1: Ch 1, sc in each ch around; join with a sl st in first sc - 56 (64, 68) sts. Rep Rnds 2 and 3 until 5 ½ (6, 6 ½)" from beg. Shape Top: Ch 1, [dec, sc in next 9 (11, 12) sts, dec, sc in next sc, place marker] 4 times; do not join at end of rnd. Next Rnd: [Dec, sc to 3 sts before next marker, dec, sc in next st] 4 times. Rep last rnd 3 (4, 4) more times - 16 (16, 20) sts. Size 12-14 Only: [Dec, dec, sc in next st] 4 times (12) sts. Ch 19. Row 1 (Wrong Side): dc in 4th ch from hook and in each ch across; turn - 17 sts. Rows 2 and 3: Ch 2, skip first st; yo, insert hook from front to back to front around the post of the next st, yo and draw lp through, [yo and draw through 2 lps] twice - fpdc made; work 2 more fpdc; yo, insert hook from back to front to back around the post of the next st, yo and draw lp through, [yo and draw through 2 lps] twice - bpdc made; work 2 more bpdc, 3 fpdc, 3 bpdc, 3 fpdc, hdc in top of beg ch; turn. RIGHT MITTEN: ** With smaller hook, ch 9 (11, 11). Row 1 (Right Side): Sc in 2nd ch from hook and in each ch across; turn - 8 (10, 10) sc. Shape Thumb Gusset: Ch 1, sc in first 12 (13, 14) sc, place marker, [inc] twice, place marker, sc in each sc across; turn - 23 (25, 27) sc. Next Row: Ch 1, sc in each sc to marker, inc, sc in each sc to 1 st before next marker, inc, sc in each sc to end. Rep last row 2 (2, 3) more times - 29 (31, 35) sc. Size 12-14 Only: Work 1 row even. Next Row: Ch 1, sc in each sc and ch across; turn - 21 (23, 25) sc. Work even until 4 ½ (5, 5 ½)" above ribbing, dec 0 (2, 0) sts evenly on last row - 21 (21, 25) sc. Shape Tip: Ch 1, [dec, sc in next 6 (6, 8) sc, dec] twice, sc in last sc; turn -17 (17, 21) sc. Next Row: Ch 1, [dec, sc in next 4 (4, 6) sc, dec] twice, sc in last sc; turn - 13 (13, 17) sc. Next Row: Ch 1, [dec, sc in next 2 (2,4) sc. dec] twice, sc in last sc; turn. - 9 (9, 13) sc. Fasten off. Sew top and side seam. Thumb: With right side facing, attach yarn in ch at thumb division; ch 1, sc in same ch and in each sc around; turn - 10 (10, 12) sc. Work even for 1 ½ (1 ¾, 2)". Next Row: Ch 1, [dec] 5 (5, 6) times. Fasten off. Sew thumb seam. LEFT MITTEN: Work same as right mitten from ** to **. Shape Thumb Gusset: Ch 1, sc in first 8 (9, 10) sc, place marker, [inc] twice, place marker, sc in each sc across; turn 23 (25, 27) sc. Next Row: Ch 1, sc in each sc to marker, inc, sc in each sc to 1 st before next marker, inc, sc in each sc to end; turn. Rep last row 2 (2, 3) more times - 29 (31, 35) sc. Size 12-14 Only: Work 1 row even. Next Row: Ch 1, sc in each sc and ch across; turn - 21 (23,25) sc. Complete same as for right mitten. Designs by Marilyn Coleman and Gayle Bunn. ABBREVIATIONS: beg = beginning; ch = chain; dc = double crochet; dc = double crochet; hdc = half double crochet; mm = millimeters; pat = pattern; rem = remaining; rep = repeat; rod = round; sc = single crochet; sl = slip; st(s) = stitch(es); tog = together; yo = yarn over; [ ] = work directions in brackets the number of times specified.